Tired of using binoculars when bird watching? Perhaps, it is time to use window feeders. Of course, using binoculars to clearly see the birds and their activities is a great thing to do to. The binoculars have the ability to see even the smallest bird that stops by your yard. 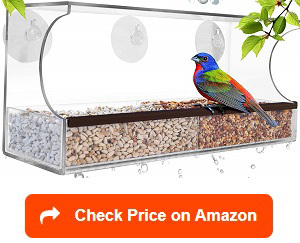 Still, having the best window bird feeder attached to your clear wall might just be the answer to how best can you enjoy the colorful birds. Bird feeding as a hobby became popular especially in places that get a lot of migrant birds during the year, spring and then summer. These feathery friends are not only cute but an absolute source of source of joy. 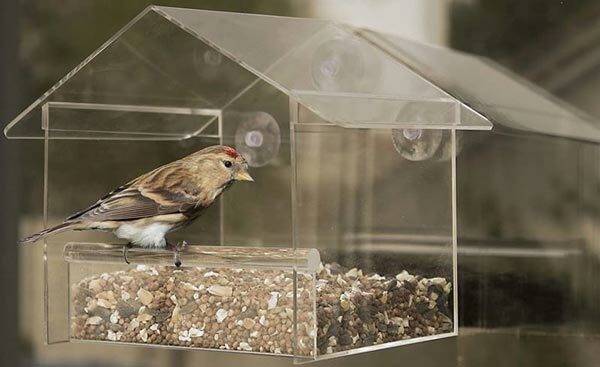 Available in various forms and shapes, these window feeders can be easily attached to your windows using strong suction cups to give you that ‘up close and personal’ experience with the birds. Still, like any other feeder, it is important to read the fine prints and get inspiration from expert birders on which bird feeder is best for your type of window. Some of the best feeders are featured in this article. Most birders feed the birds for one thing –they are so cute to watch. Their colors, their sound, and sometimes, getting a songbird is a bonus. It is a past time worth investing on. Getting a bird feeder that lets you have this purpose is what matters. To do such, Nature’s Hangout Outdoor Window Birdfeeder is perhaps the best window feeder you can pick up from the pet shop. So far, nature’s hangout is producing high quality and well-designed bird feeders. For leisure bird watchers, hanging out a bird feeder by the window provides you the perfect spot to enjoy the beauty of the local bird species from the comfort of your own home. The product, made of transparent, high quality acrylic lets you see everything the birds are doing while feasting on the seeds. The removable tray makes it easy to clean, which is perfect because you want a spotless look of your birds by the window. Nature’s hangout promised of connecting human and the wonder of nature comes true in this feeder. Of course, the first consideration is on whether or not the birds will find it so make sure it is within reach by the birds. While everything else is great, the only downside of this feeder is the possibility of being attacked by uninvited guests or predators such as raccoons and cats. So placing it few feet away from the ground, far from their reach is the best solution. Finding a bird feeder can be a challenge too. Good thing Nature Anywhere manufactures the most classic bird feeders such as their classic window mounted bird feeder. Among the window feeders, I love this feeder and it has nothing to do with the functionality but because it reminds me of the time I used to house birds. The classic tiny glass house design is perfect to accommodate as many little birds in their beautiful feathers. Let the Nature Window Feeder be attached to your kitchen window and enjoy the birds up close while you do your own thing. The sliding seed tray also makes this product so easy to fill and clean. Even young birders can do the refills. Certainly, such chore is a good way to train kids to love nature and take care of birds. Correct placement is a must though. If you place it 10 feet above ground, ledges and tree branches then you’ll be sure it will be squirrel proof. No squirrel climbs glass windows so it will be safe. I think the only downside of this feeder is its size. If you intend to attract doves or medium size birds, then they won’t be able to fit in comfortably. Orioles, hummers, warblers and finches are perfect for this feeder. 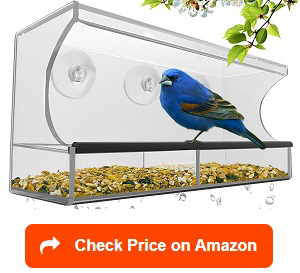 Also, the price is a bit more than the average window feeders. Hoping to get many birds all at once? What is great with bird watching is the delight brought about by the multitudes of colors – soft feathers in various shades. With the futuristic Window Bird Feeder 2019 Model created by Nature Gear, you will have non-stop guests by your window. In my standard, a window bird feeder can only be considered great if it has the following features; crystal clear design so you can take pictures if you need to, all weather design so I don’t need to worry about rotting bird seeds and functionality, which ensures that birds do not need to eat bad seeds and get sick. 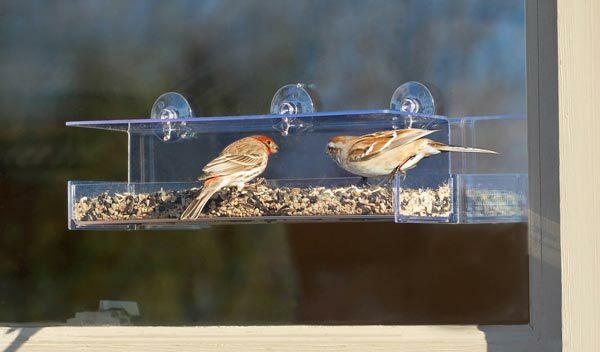 The Window Bird Feeder – 2019 Model offers enough space for perching, making both feeding and watching fun. It is fascinating to see how birds take care of their food as well. They perch to avoid contaminating their food by sitting on the precious seeds or pooping on it. Aside from its pretty design, this feeder is large enough to accommodate few cardinals and blue jays along with cute and fancy looking birds. No wonder expert birders rated this up to the 5 (stars) in their window bird feeder reviews because of its quality and durability. When placed a bit low, squirrels may find it so make sure it is up and away from anything squirrels can possibly climb unto. You don’t want to waste your precious seeds to them. During harsh climate – too hot or too hold, re-filling the seeds can be a real hassle. So getting an inside window bird feeder is a saving grace. Good thing, Nature Gear develops and manufactures great feeders. 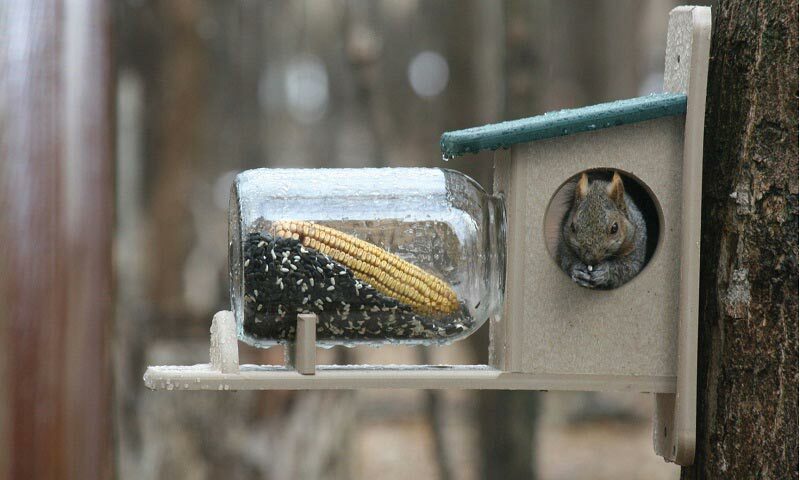 The UPGRADED Feeder, Sliding Feed Tray, Large, Crystal Clear, Weatherproof Design, Squirrel Proof to keep bird seed dry is one of their window feeder invention. What I really think is great with this product is the fact that it is safe for all birds. It means that you might be able to witness a combo of various colors right by your window. 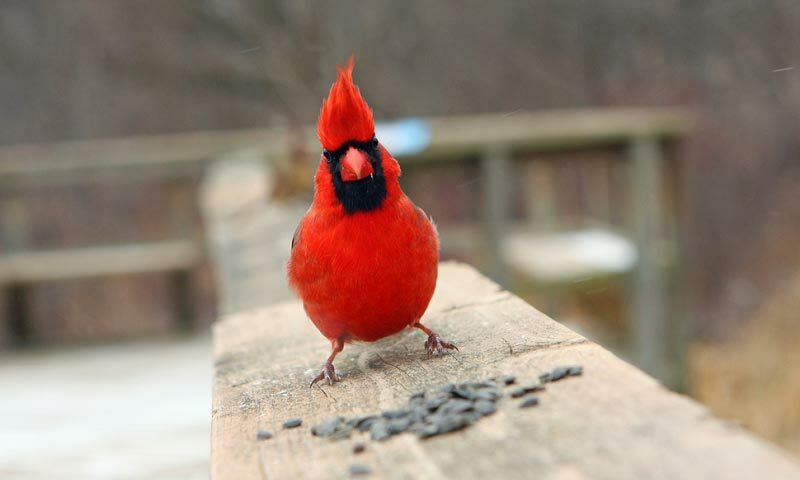 It is also weather proof giving birds the same benefit of fresh seeds even in bad weather. Because of its roof, the seeds are protected, kept dry and inside the feeder where belongs. 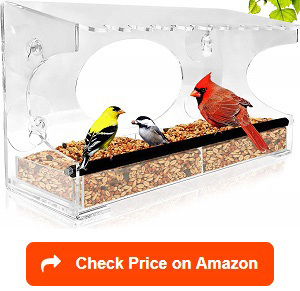 With price positioned in the mid-range, this upgraded window bird feeder is a must. It is not only pretty to look at but it is durable and functional. The removable sliding tray makes it easy to refill, even indoors. I also like the large tray as it does not only carry enough birdseeds but it also allows larger birds like the Woodpecker and Robin to eat along with the usual sparrow and finches. This may not always be favorable as bigger birds can bully smaller songbirds. Expert birders who have tried the upgraded version gave it a high 5 because of quality and functionality. 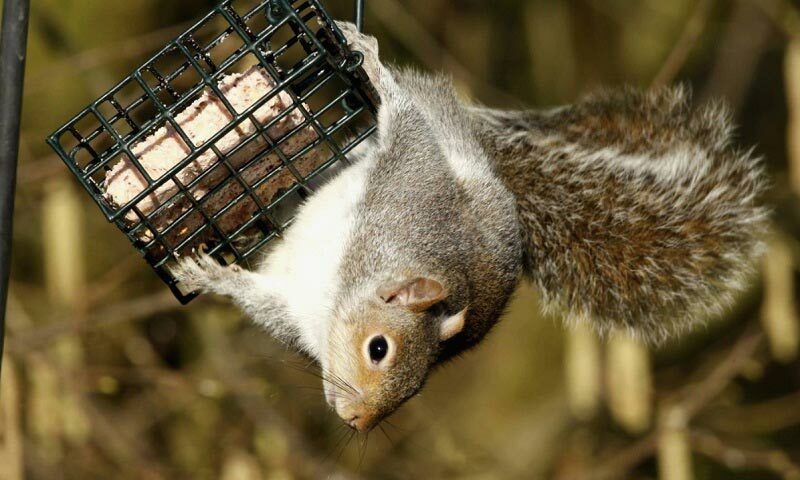 Of course, the glass-covered sides also deters squirrel to feast on the birdseeds. Wanting a window bird feeder that does not occupy large space? How about window feeders that attracts beautiful hummers? Then you can opt for simple designs such as the Aspects 407 Hummingbird Feeder, 8 oz. Aspects 407 Jewel Box is a true gem with its beautiful design specially made for hummingbirds to give you a great show by your window. With its 3 nectar ports, this is perhaps the best window attached bird feeder as it can accommodate three beautiful birds for your enjoyment all at once. 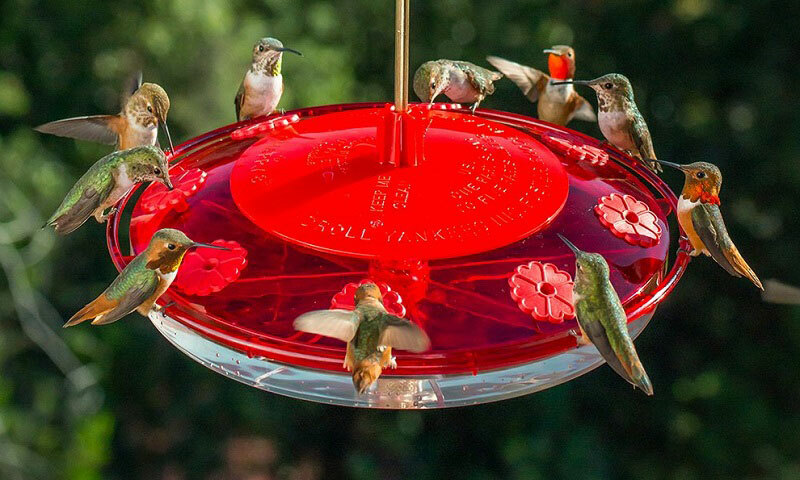 This reasonably priced window hummingbird feeder has a bright red crystal color that attracts the birds. The non-obstructive design gives birds enough place to perch and yourself enough space to watch. You do not even need to get distracted of the suctions as it is leveled with the feeder. It’s pure, clear view of the just the birds in action. 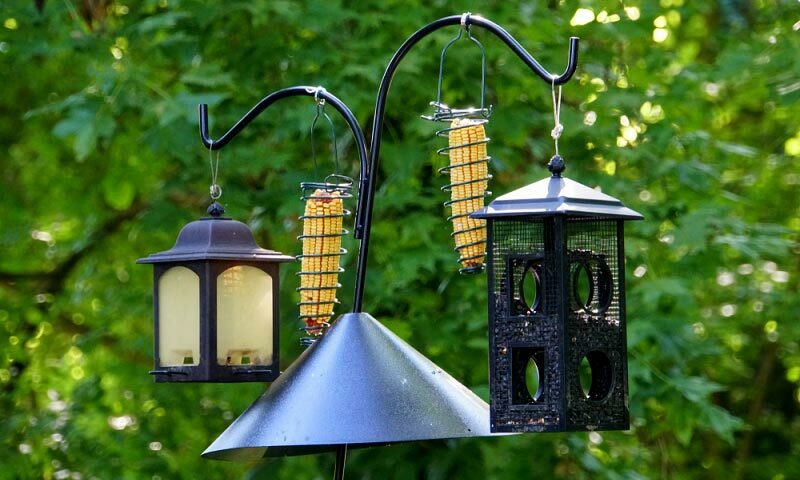 Birders who have tried this product say it is great to put this up during the start of the spring and watch the hummers get their nectar fill. Its 8 oz capacity is enough to make those hummers very happy. However, the product’s simplicity is its strength and weakness. During refilling time, you need to remove the entire window feeder, clean it up and then refill. A sliding tray should be a great benefit to reduce the mantling and dismantling of the feeder. Still, the good features override the bad. Do you love birds but do not want to block your glass windows? Keeping your window free of blockage would mean less to none attached to it. 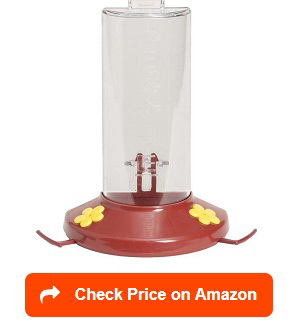 If you can’t choose between bird watching and a spotless view of your window then the Perky-Pet Window Hummingbird Feeder (8 oz) is your best choice. This 10-inch vertical window feeder is a great space saver as compared to the more elaborate window feeders. 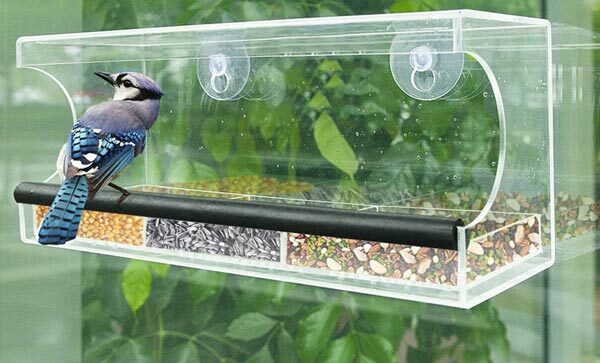 With its unique design, this window bird feeder has a one-way mirror effect with its shatterproof plastic body, which also makes it convenient to see when the nectar level is low. This will provide you the approximate time of refill. Hummingbirds are attracted to red so the red nectar as well as red bottom of the window feeder are sure way of inviting the guests better. I like the two east feeding flowers and two perches because it gives the hummers chance to mill around while digesting their food. That means longer viewing time at the comfort of your home. While I believe that the price is reasonable for a Perky-Pet product, the product is far from perfect. One of the downside are the feeding flowers, which are too small and too few and when the feeder is full to the brim, then it will be difficult to see the whole birding from inside the house. 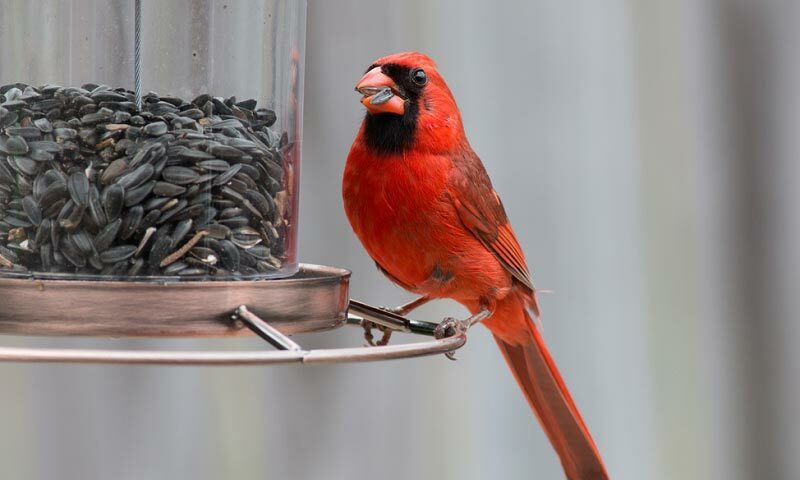 When it comes to window bird feeders, cheap price does not mean cheap products. At least this is true for GrayBunny GB-6851, which comes in large birdseed tray with drain holes to keep the expensive seeds dry all throughout. 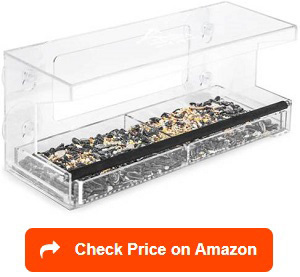 The price, way below than most bird feeders still offers the same quality and durability for birds and birders to enjoy: large, extra deep tray, extra thick yet crystal clear acrylic, lightweight and super strong suctions that keep the feeder steady. What I love about this feeder are the features that make refilling the seeds easier. The tray is removable and it can hold 4 cups of tray. The large tray also has dividers, which means that I can mix other seeds without a problem. These seeds will benefit many other species. Imagine the different colors all converged in our feeder when you wake up in the morning – it’s truly fascinating. The only downside of this feeder is the curved design on its sides, attracting squirrels to enter the seed tray without much ado. While the squirrels are fun to watch, it drives away the true purpose of putting up the feeder – the birds can be gone in no time. When they see threats in a feeder, it can be very difficult for them to come back and try. The flat roof surface can get a little messy too, with bird poops as they use it to perch or simply to wait for their turn on the seed tray. Solution is to put it under bushes so dried up bird poop can simply be dropped on the plant for added soil and plant nutrients. Easy to put up. It has strong suction cups that hold on to the glass window for a long time. Birders who have tried the Wild Birds of Joy Bird Feeder has only one thing to say, “it’s a high-quality window bird feeder” and that result is no surprise considering the functionality of this feeder. Clearly, the birds love it as much as I do. 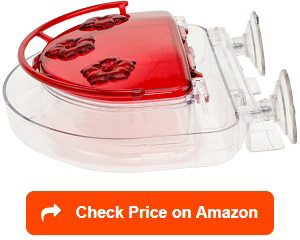 To stick it to the wall securely, the feeder comes with 4 suction cups keeping it there longer. Mine is there for few years now and still works. The shatterproof acrylic is great especially if you have nasty squirrels that may come and ransack the seeds. BY rule of thumb, attaching it higher, between 5 to 8 feet above ground and in the middle of the glass window will ensure that no squirrels will ever come. Because it can hold at least 3 cups of seed, it can feed as many birds as possible. That means you also have a chance to see varieties of birds. The family and your cats will surely enjoy the view. With a larger carrying capacity, you do not need to refill as often. Sold at an affordable price, this Wild Bird of Joy window feeder can be one of the most practical feeders on offer. The only problem is when squirrels will find the opening on its sides, get into the tray and finish off the seeds. If you do not like squirrels sharing in the fun, don’t attach it to anywhere they can reach. A bedroom window is a better option than your low kitchen window. Big enough to accommodate few other birds at one feeding time. Easy to clean with removable tray. Do you want to see a mix of a traditional and modern birdhouse? Then the 348 Birdscapes Feeder is the best choice. It comes in crystal clear design so you can have an up close and personal encounter with the birds while inside the comfort of your own home. This cute little house can carry 1 cup of seeds and small enough to accommodate only the small and colorful birds. You do not need to worry about big bully birds eating all the seeds, as they won’t even fit in this tiny heaven, intended for your tiny feathery friends. Still, the Birdscapes Clear feeder by Perky Perks is economical and convenient as the roof also serves as a protection to the seeds and a place to perch, giving you longer time to see the birds even in their lazy moments. There are few other things that makes this one of the favorites of birders: it is squirrel proof as the tiny item will not hold a squirrel’s weight and it attracts birds easily because the design looks like a traditional birdhouse hence they seem to be friendlier to it. The roof, much like a house, is cleaner as the birds can’t really stay there too long. It is fascinating to see them slide down the shatterproof plastic roof each time. While the Birdscapes Clear Window Feeder 348 is a great product, the only downside is the hassle of taking it down and attaching it back again during cleaning time. Not a hard task to do but it can be time-consuming when you don’t have a lot of extra time. But considering its very low price, it is great to have one at home! 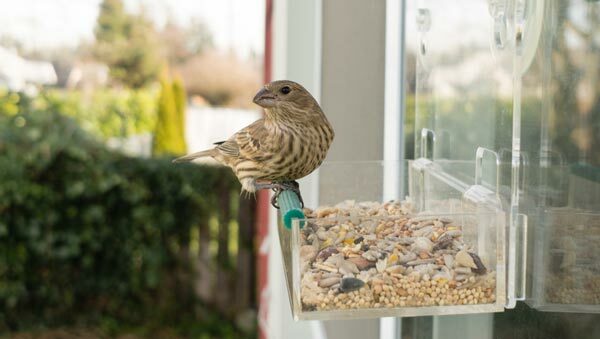 Unlike any other feeders, window feeders are probably the best ones to get if your main idea of feeding the birds is well–to watch them do tricks! Most window feeders are made out of tough, non-yellowish, and crystal clear design that attaches to your window through clear and strong suction cups. 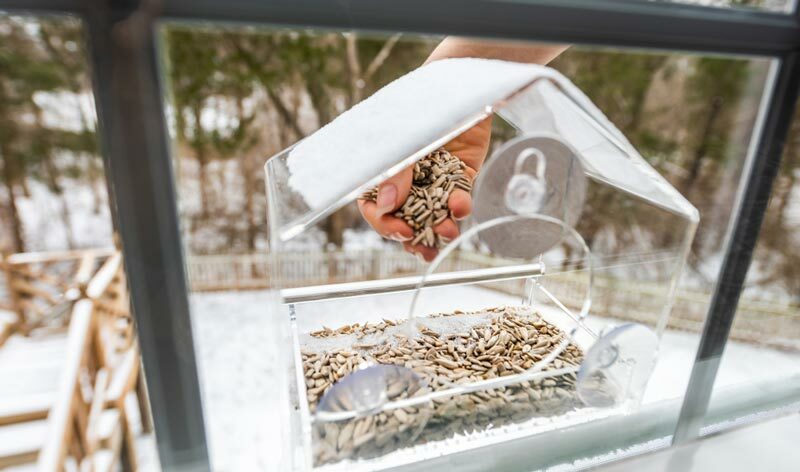 Window feeders are popular because of the accessibility of the seeds to almost all types of birds. Hanging feeders sometimes can only be for specific types of birds but with window feeders, you can actually mix seeds and watch the birds flying over for a fill. Most window feeders are designed to have perches so you can also see them while waiting for their turn to it to when they laze around after a fill. But whatever window feeder type you choose, it will be the same kind of fun. Most window feeders come in a variety of styles such as the ones featured above. Some of them include tube feeders, platform feeders, nectar feeders and jelly feeders. Choosing the right window bird feeder depends on what kind of birds you are trying to attract. Window feeders have one side mirror effect that allows the people inside the house to see them very clearly but not get distracted by human movements. Clear View. Because they are made of transparent plastic or acrylic, you will have a truly ‘up close and personal’ encounter with the birds. You will what they do without them getting disturb of what you do. Suction cups. 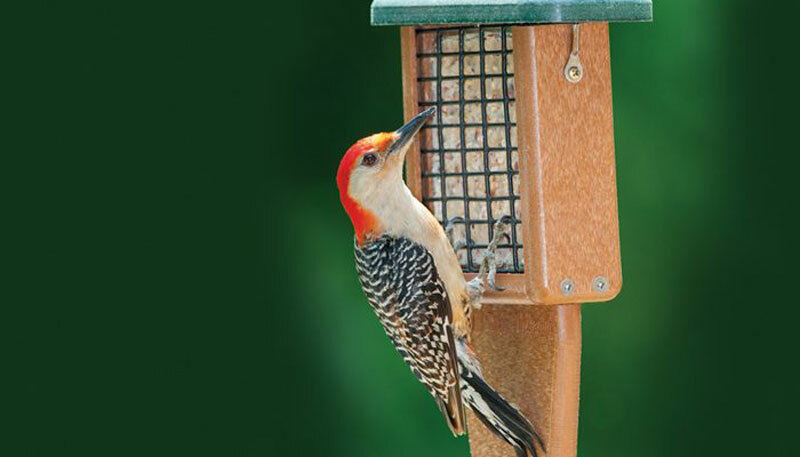 These feeders’ suction cups hold the feeder with seeds and birds without a problem. Super strong to keep things together. Easy Refill. 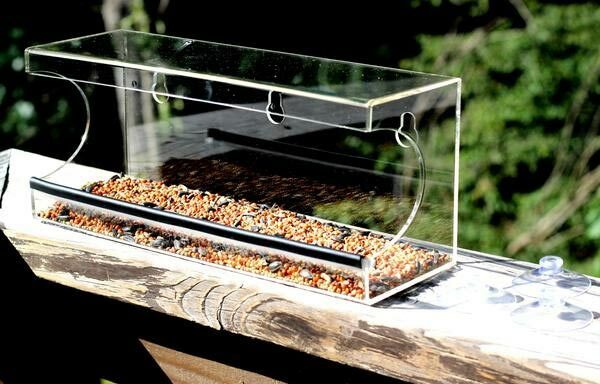 Window feeders either have sliding trays or wide opening that allows you to fill it up with new seeds from indoors if the window can be opened. This is perfect at feeding the birds even during bad weather. Safety for the birds. Most predators such as squirrels, raccoons, cats, snakes and other birds of prey normally hangs around bird feeders placed outdoor or in the yard but avoid getting too close to human home. The birds get to eat peacefully. Perching Area. Most bird feeders provide perches so they can eat comfortably. This is always a fascinating sight to see too! Every bird is different. The differences can be easily seen in their size, the food that they eat and the feeder they eat from. All of these factors affect your buying decision. There are many and diverse reasons why window bird feeders are popular among bird watchers. Obviously, the closer the birds, the better it is. More than the superficial reasons though, there are many other reasons why window bird feeders are great for keeping. Kinds of birds. Before you open your wallet at a pet store or key in your credit card for an online purchase, settle on what kind of bird are you trying to attract. A hummingbird will require a smaller feeder while a cardinal might need a bigger one. Food capacity. Once you are settled on the kind of bird, you need to work on how much is the capacity needed to feed the bird. Attracting Blue jay, you probably need a much bigger capacity, say 3 to 4 cups while finches can settle for the one to 2 cups. This will spell difficulty in filling it up. Feeder Placement. Yes, window. But where? The size and design of your window bird feeder should give you an idea for proper placement. Do you have a clear window that is high enough and far from tree branches and ledges? If not, squirrels might come feast on the seeds instead of birds. Design. Some designs work best for some window types. The flat but roofed bird feeder allows you to see more birds. This is great for large and non-obstructive windows. If you have a small window area, perhaps, the tube feeder type is a good option. Price. Reading the reviews of the different window bird feeders is your first step to finding the best one. Not all that is expensive is good. Some cheaper feeder are so simple that the birds love them most. Weather proof. This is very important. The best window bird feeder should be able to withstand inclement weather changes. If your window gets wet easily when it rains, then putting up a window feeder may not be your best choice. If not, choose a feeder design that has a roof to protect the seeds. Bird safety and comfort. Think of feeder that is friendly to the kinds of birds you are trying to attract. Does it have perches for small birds to sit comfortably while feeding? All in all, feeding wild birds is a great thing to do but watching them while drinking your morning coffee? That’s a treat you don’t get often. Using a window bird feeder is easy. Attach it, fill it up, and watch it. However, they may be some issues you also need to pay attention to such as placement, cleaning, maintaining and taking care of the seeds. Can you see the feeder well? It is a window bird feeder after all. The birds should be able to find it for you to be able to enjoy it. It’s both ways. There is no point putting up a window feeder that you can’t watch. Is the location safe for the feeder (and the birds)? This one requires careful planning and if possible, calculation. Take the measurement of the spaces available from all sides of the window feeder. It has to be far from ledges, windowsills or tree branches so predators can’t come and steal the seeds, or worst, kill the birds. Most window feeders are easy to clean. With removable seed tray that is present in most designs, it makes the job half done already. To ensure that you have a slick looking window feeder, remove the tray, clean it, air dry it and then fill up again. Also, clean the body of the window feeder at least every one or two weeks. You do not want to get distracted seeing bird poops instead of birds and their beautiful colors. This requires a bit of buying strategy. While all stores (pet stores) or even online shopping companies offer the same product, they may not have the same kind of service or even price. 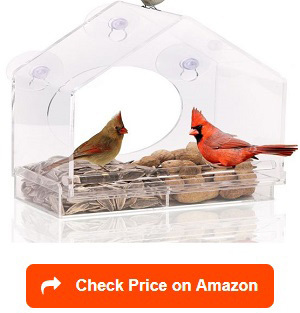 Walmart offers some of the cheapest window bird feeders you can have your hands on. 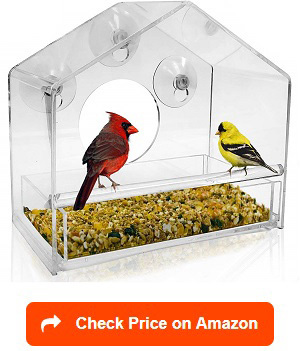 They also offer reduced price in some of their pretty window bird feeders. Home Depot has a selection of bird supplies including window bird feeders. 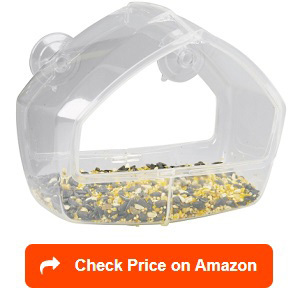 Because they put prices in wholesale, they even sell feeders at a price cheaper than pet shops. Amazon is a one-stop shop. You can practically buy all types of window bird feeders without much hassle. The delivery is efficient and a customer service is on standby incase the product gets some problem after you opened it. Before buying any product, it is wise to look at the ratings as well as what other buyers say about the product. Are window bird feeders safe? Absolutely. Because of how the glass window reflects the sky, they tend to fly right into clean windows all the time. By putting window bird feeders, they will know it’s not a sky hence they will avoid flying right in. You save their lives twice: crashing into the window and from hunger. How to attract birds to your window feeders? If you have a backyard planted with flowers and plants, then attracting birds should not be a problem. They will come willingly. However, if you don’t have one, it might be a little struggle to invite them in. With window feeders, you reduced the waiting time by half. The feeder is within their flying vision, so they will see it fast enough. 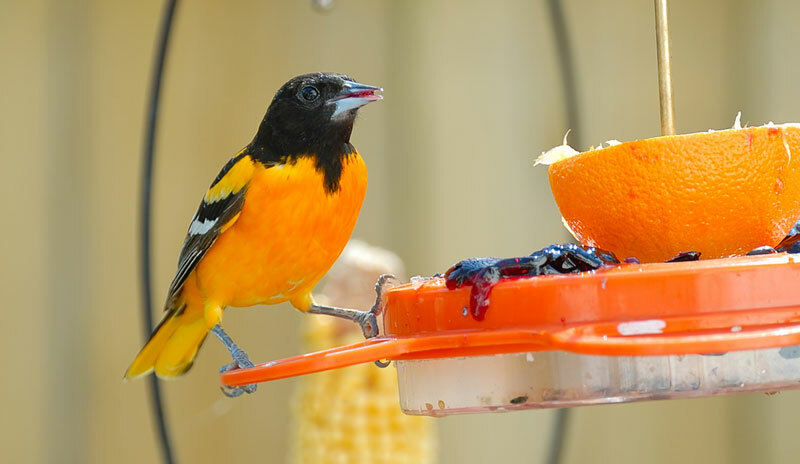 Some birds are also attracted to certain colors so putting colorful seeds or colorful nectar containers will eventually get the birds over to your window. The good thing is, once they found it, they will surely come back for more, regularly. Finding the best window bird feeder is actually quite easy. Most products have designs that are very identical to each other. This makes the choosing a lot easier. More than choosing the right product, window feeders has plenty of other purposes including the possibility of educating your child about birds while you all watch, keeping the cats occupied by watching the birds but not able to touch it, and your own enjoyment of seeing the birds up close and personal. 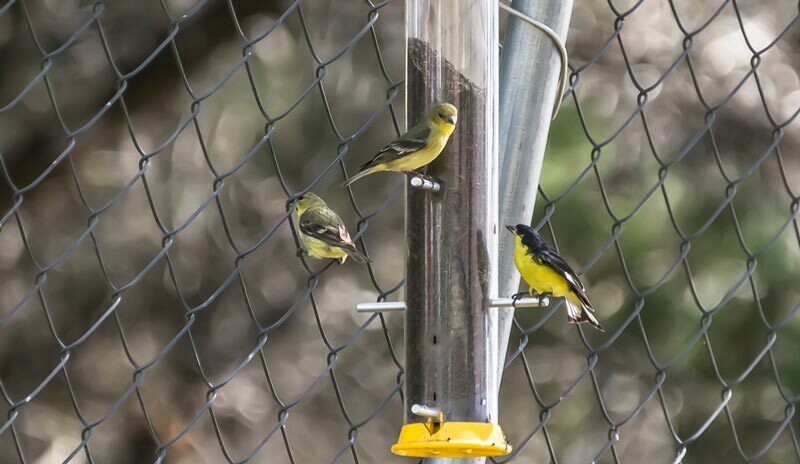 Whether you are an expert birder or a beginner, a window bird feeder might just be the best choice to jumpstart your hobby or simply to keep the feeder as an addition to your feeder collections at your yard. 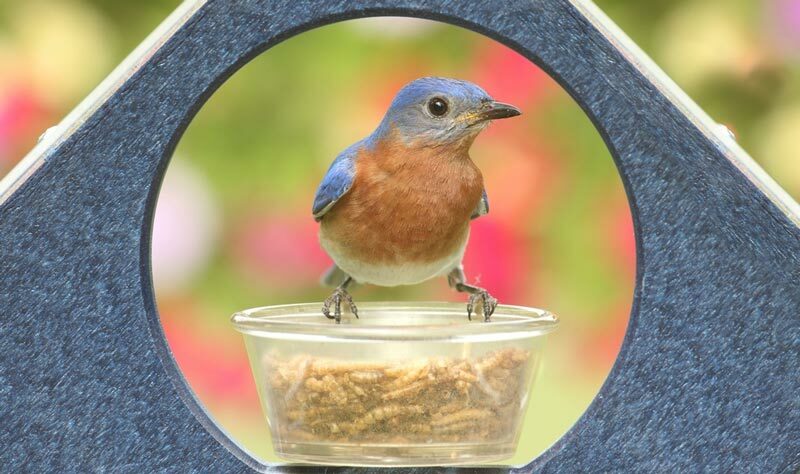 Whatever the case, the joy of bird watching will never be the same again once you get a hold of a window bird feeder that gives you the best view.